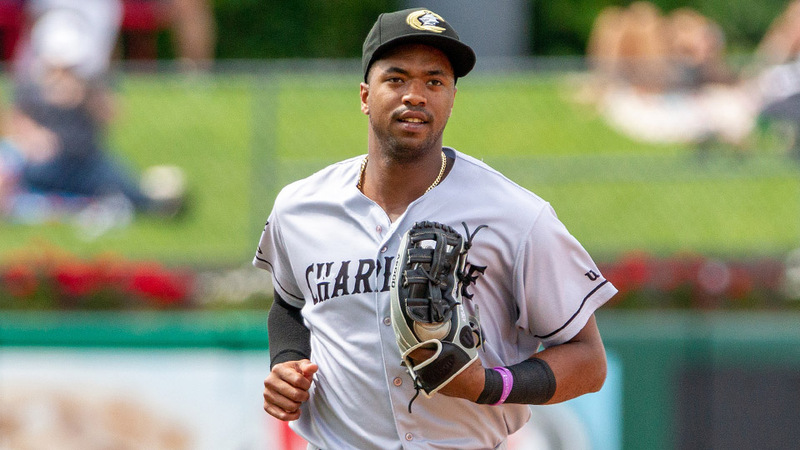 Eloy Jimenez might not have much to prove in the International League after his performance last year, but he'll begin this season on the circuit regardless. The top White Sox prospect was optioned to Triple-A Charlotte on Wednesday, along with third-ranked Dylan Cease. Additionally, the club reassigned No. 4 prospect Luis Robert to Minor League camp. Jimenez started off the 2018 season with Birmingham, where the 22-year-old bopped 10 homers, drove in 42 runs and posted a .317/..368/.556 slash line. That prompted a promotion to the Knights, and MLB.com's third overall prospect feasted on Triple-A pitching even more than he had in the Southern League. He batted .355/.399/.597 with 12 dingers and 33 RBIs in 55 games for Charlotte. But the Dominican Republic native struggled during his time in Spring Training with the White Sox. Jimenez hit .154 (4-for-26) with one homer and three RBIs over 26 at-bats in Cactus League play. "We all know the talent he has, the kind of personality that he has," White Sox first baseman Jose Abreu told MLB.com through interpreter Billy Russo. "We are all very excited about him, and I don't see any reason why he can't succeed as soon as he gets here." "Obviously we're still extremely bullish on his future," White Sox general manager Rick Hahn told MLB.com. "We think he's going to be an impactful White Sox for a long time, and sending him out really doesn't change our long-term view of him. He responded very well with some of the things we talked about to him last season." Cease, albeit in a smaller sample size, had more success this spring. The right-hander made two appearances (one start) and allowed one earned run over a combined 2 2/3 innings. The No. 21 overall prospect yielded four hits and walked two with two strikeouts. Last season was a breakout year for Cease, who posted a 12-2 record with a 2.40 ERA over 23 starts between Class A Advanced Winston-Salem and Birmingham. The 23-year-old fanned 160 batters in 124 innings and held opponents to a .289 batting average. His first start for Charlotte will mark his first outing above Double-A. Jimenez and Cease came to the White Sox in the trade with the crosstown rival Cubs for Jose Quintana in 2017. Both eventually are expected to be key cogs in Chicago's rebuild. Robert, meanwhile, had the best spring of the trio. The Cuban native went 4-for-11 (.364) with one homer, six RBIs and two runs scored. Injuries held the No. 40 overall prospect back last year, as he played 50 games between Class A Kannapolis and Winston-Salem. The 21-year-old made up for it in the Arizona Fall League, where he batted .324 with a .800 OPS and two home runs. "They're going to succeed in every league they're going to play," Abreu told MLB.com. "We all know the talent they have, and hopefully we see them soon here." The White Sox optioned catcher Seby Zavala (No. 22) and right-hander Jordan Stephens (No. 29) to Charlotte as well. They also sent Micker Adolfo (No. 8) to Birmingham, while catcher Zack Collins (No. 12), righty Jimmy Lambert (No. 19) and Donn Roach were reassigned to Minor League camp. Age is just a number for Luis Garcia. The Nationals' third-ranked prospect, all of 18 years old, earned an invite to his first Spring Training this year after a strong showing in the Minors in 2018. But his tenure as a non-roster invitee with the big club ended when Washington reassigned him to Minor League camp Wednesday. The No. 75 overall prospect displayed why he was worthy of an invitation in 15 spring games. Garcia went 6-for-19 (.316) with seven runs scored, two RBIs and two walks. The left-handed hitter went 3-for-3 with two RBIs and scored twice Sunday, his best Grapefruit League showing. As one of the top international signees in the 2016 class, the Nationals threw Garcia into the fire in 2018 with a full season in the Minors. The Dominican Republic native handled the task with aplomb, hitting a combined .298/.336/.406 between Class A Hagerstown and Class A Advanced Potomac. Garcia needed only 78 games to show Washington he required more of a challenge than the South Atlantic League, and he was even better as the Carolina League's youngest player during the second half of the season. Over 49 games with Potomac, Garcia batted .299 with a .750 OPS, four homers and 23 RBIs. Evidenced by the organization's aggression in promoting Juan Soto last year, Garcia could follow a fast track to the upper levels of the system. Soto debuted in the Majors when he was 19, and Garcia is two months shy of his 19th birthday. The Nationals also reassigned infielder Matt Reynolds, utilityman Brandon Snyder and infielder Jacob Wilson. Austin Adams was optioned.